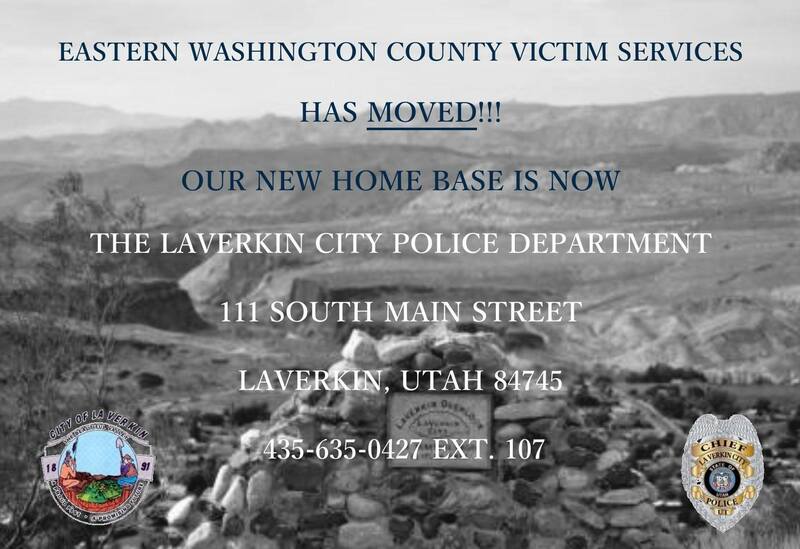 LAVERKIN — The Eastern Washington County Victim Services Program, previously located within the Hurricane Police Department, has moved to the LaVerkin Police Department and continues to serve communities throughout the eastern half of Washington County with services for victims of domestic violence and other crimes. The program operates with state and federal grant money and was started in Hurricane in 2009. It was moved to LaVerkin in July 2018. Although the change of location was announced on the program’s Facebook page, the change still isn’t reflected on the Hurricane Police Department’s website. Individuals seeking help still continue to go to the Hurricane Police Department, unaware that the program has moved, said Tiffany Mower, the program’s victim assistance coordinator. People who arrive for services in Hurricane are then redirected to LaVerkin. However, even asking victims to go to another location can often create a difficult situation, Mower said. “It takes so much courage for them to take the first step to get help, so when they are told to go somewhere else they may give up and go home,” she said, explaining that there is an enormous amount of fear that comes into play when many victims decide to get help. Anyone seeking help can go to the LaVerkin Police Department during office hours at 111 S. Main Street or call 435-635-0427, Ext. 107, which is forwarded to a 24-hour crisis line with advocates who can help. The program is funded with grants from the federal Violence Against Women Act and the Victims of Crime Act. The program is designed to advocate for the victim through collaboration between various law enforcement and service agencies in eastern Washington County, including the Washington County Sheriff’s Office, Hurricane Police Department, Springdale Department of Public Safety and Utah State Parks. The program also works closely with the Dove Center, which provides safe shelter, counseling and other services to those affected by domestic violence. Protective order requests for victims of domestic violence. Child protective orders for victims and families. Civil stalking injunctions for victims of stalking/harassment. Dating violence protective order requests. Advocates can also assist in filing the documents with the courts, if needed. For more information, contact the Eastern Washington County Victim Services Program at 435-635-0427, Ext. 107.